Records tumbled everywhere as Hertford completely overwhelmed Hornsey by 398 runs in the first round tie of the Evening Standard Trophy competition. With only the 2006 handbook as a guide `Standard’ records can only be noted as probable. These include the Hertford total of 485-3, Steve Cordingley’s 275*, 247* for the fourth wicket by Cordingley & Darby and Ashlen’s 0-113 off ten overs. Needless to say many Hertford records were broken, most notably the record for the highest individual score held by George Nicholls with 217 against Cheshunt back in 1888. 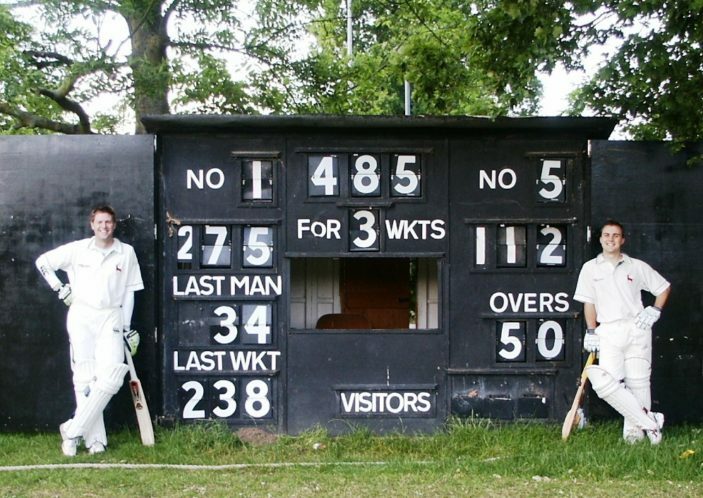 On that day Hertford ran up 515 against Cheshunt who were dismissed for just 48. So Hertford totals and winning margins were not exceeded, though in 1888 they were not limited to 50 overs. Unfortunately for Hornsey they played one short, their eleventh player failed to turn up and they had been forced to make several changes from their preferred team. However nothing should be taken away from Hertford’s magnificent all round performance. The match started well for Hornsey. Having inserted Hertford they were rewarded immediately with a wicket when Scott Ruskin obligingly hit a long hop straight to mid-wicket. Jon Ryan, promoted after a fine innings earlier in the season, justified his elevated position with some graceful off drives but it was Cordingley who caught the attention as he soon launched into his favourite shots, driving superbly in the “V”. Hertford’s 50 came up off 41 balls, an ominous sign but skipper Fawden brought himself on and slowed the rate by conceding 10 runs off his first four overs. The second 50 took 58 balls but just before that was reached Ryan was caught at the wickt by Cable off Giles for 28. Cordingley had proceeded to 61, looking impregnable, his fifty coming off just 35 deliveries. The next partnership, with Tom Bancroft, upped the scoring rate from with 140 coming off 15 overs. Bancroft hit 34 off 38 finding the boundary with some excellent cover and square drives but he was happy to keep Cordingley on strike as much as possible and Steve made full use of the opportunity racing to his 100 off 69 balls and 150 off 95. The third wicket fell in the 30th over and it is an adage that the target for the batting side should be to double the total at this stage, provided there are wickets in hand. Hertford were 238-3. Enter Rob Darby. Hornsey were now visibly reeling under the onslaught and it mattered not who bowled. Overs conceding 20 or more became frequent, anything under 10 was considered a good over for the bowler. Darby scored freely at the start, six of his first scoring shots reached the boundary. He then gave Cordingley the strike to see him to his double century – this came courtesy of a dropped catch, Cordingley’s first chance, when he was on 199. The double century had take just 121 balls. His next 50 took just 16 but this was not to be the fastest. As Hornsey fielders operated in retrieval mode, Darby, having posted his fifty off 44 balls, now scented a century for himself and went after the bowling. Two superb drives saw towering sixes heading into the car park as he raced to his century, the second fifty taking just 15 balls. The last over started with a dot ball – the first since the 43rd over – Darby hit a final six and Hornsey’s torment came to a close at 485-3, the score at 30 overs being more than doubled. There is another record to report, Ashlen conceded 113 runs off his ten overs, the most expensive in the tournament’s history. Hornsey’s innings was doomed to be an anticlimax, unless as in the recent Australia/South Africa game they had a batsman who could match Cordingley. Makwana tried his best but having reached 50 off 45 balls hit a full toss from Jon Ryan to deep square leg where Steve Cordingley took the catch. Hornsey were then 72-2 off 17 overs. Ryan then ran through the middle order taking 4-9 and Richard Cordingley nipped in with the wickets of two tailenders as Hornsey subsided to 87 all out in just 27.3 overs. Rain was threatening as the game drew to a close but Hertford, chasing everything in the field, were in no mood to allow run rates to come into it. A tremendous performance all round. Cordingley’s fifties – 35, 34, 26, 26, 16 balls – innings 153 balls. Hertford’s fifties – 41, 58, 35, 30, 19, 30, 35, 18, 18.